Just 26nm away, as the crow flys you can be there in 15 minutes. Do your homework when Farm Strip flying! It’s all well and good someone you’ve never met before saying it’s cool for you to come try and land a Cessna down on their farm – but you need to remember this is a flight to an Unlicensed bit of grass (airfield would be far to grand for the reality of most farm strips). Any hedges, public footpaths going straight through it? Remember that Googles data is often out of date, but it’s better than nothing. Google Labs has a neat feature for Measuring the ground, even if the farm owner or guide has told me how long the strip is, I like to measure it to be sure. 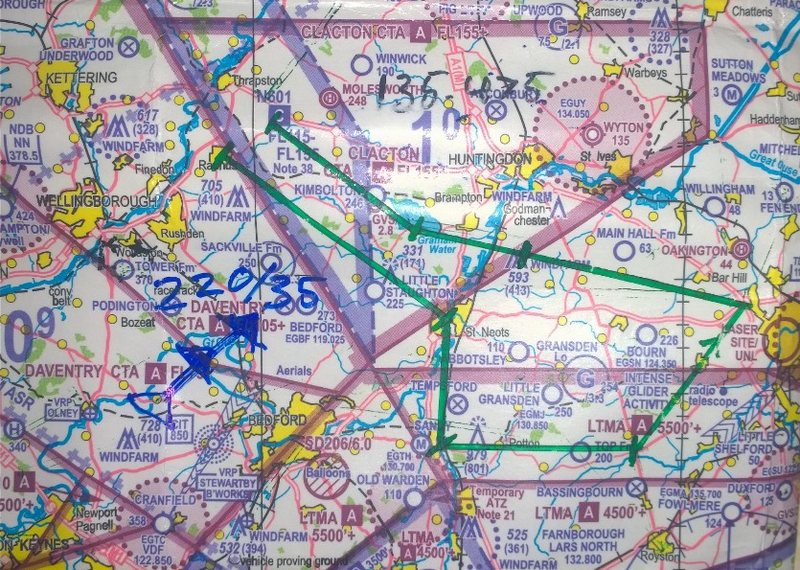 Think seriously about your diversion plan, it’s more likely that you won’t like what you find on arriving at a farm then it is on arriving at somewhere like Cranfield Airport. A windsock is a nice to have but most farm strips don’t seem to have them, not essential, but anything you can do to have a plan of where you might see some smoke rising (a local factory, a nearby cottage etc.) is good local knowledge to have as you can use that smoke to tell you what the wind is doing. Flying with one of my best friends, I always brief my passengers – it’s a standard script, that has a couple of extra notes about farms. Passengers, more so first time ones, are an interesting dynamic. As the Pilot you’re responsible for their safety and one thing I always try to remember is that even though someone might be up for going for a flight in a light aircraft. If they’ve never done it before, a variety of nerves, anticipation, uncertainty and varying degrees of confidence will be at play. 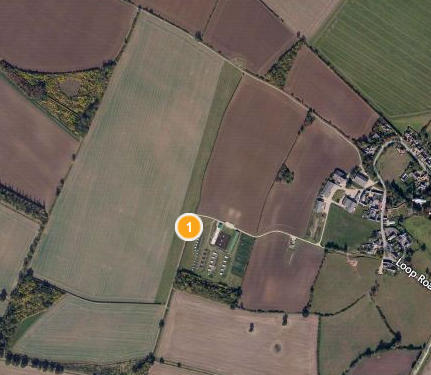 My passenger seemed happy to go into a farm strip and had been in light aircraft before, so we could stick to the planned route. The other thing first time passengers do is slow your best thought plans right down. It’s not their fault, it’s a function of never having been in a light aircraft before etc. I was the same the first time I jumped in a Cessna 172 – where’s the seat belt? How does it work again? How do I get the seat to go up? How do you get this door to close? Other than running a bit late as a result, the taxi out was all good, ATC were great as they so often are at Cambridge no real delays at all. There’s a church in Keyston that’s quite a good reference, the big green hangers of the farm are also excellent landmarks. On arrival overhead I was making traffic calls on the safety comm frequency, I joined overhead and it was looking great. A nice downwind circuit and I was juuuust about to turn base, when with one last glance at the windsock, I paniced myself, convinced myself I was about to do final approach with a tailwind and bailed from the approach. Making calls that I was repositioning for wind, I never backtracked my thoughts properly, I just repositioned and setup a circuit for the other direction. Coming in on final, we came in with a really fast ground speed (over time you do get used to judging ground speed relative to the movement of ground features etc.) – what the heck was going on! I wasn’t happy with it at all and elected to go-around. Another look at the windsock: Idiot, I’d read it right the first time, in a moment of weakness on the first circuit I’d misread it, talked myself out of my original plan and decided to change the circuit direction………the original plan was right all along. Since completing my farm strip training, I’ve become a total convert that ‘point and power‘ is the way to land a plane if precision of the touch down point is your primary objective. I’ve done a bunch of farm strips prior to Keyston – I’m not an instructor so please don’t ignore professional advise as it’s probably geared towards your own strengths/weaknesses – but once you are fully competent at landing, I’d encourage you to find an instructor that you can learn this technique from or attempt it under their supervision etc. I’ve found it really helps me to put it down where I want it. Keyston has rough terrain at the edge of its northern side and a footpath, so landing short would be a really bad idea. Measured on Google it’s about 700m end to end, but as I now have local knowledge it’s on a descending slope (north to south), so if you land to far into it from the north you’ll have gravity against you. There’s a hedge to stop you at the other end 🙁 Farms are like that – but I wouldn’t worry by the time you get there the gradient is getting pretty serious, though nothing like Tower Farm near Sywell. I now had enough knowledge of the strip and the surface winds, one advantage of having come at it from both ends, that bringing the Cessna 172 down nice and slow with an airspeed indicated of 55 knots was no problem. I think I could have got it down to 50, such was the wind, but I wanted a little bit more power on as around 50 the stall warner will start to go crazy as you cross the threshold and with first time passengers, that’s not necessarily ideal (though he had been briefed it might happen). One interesting thing to note, if you look carefully at the above picture you’ll notice there are some people in the background. They literally turned the corner and started walking on what effectively is a runway, moments after we touched down – farm strips are interesting things, to a pilot they’re a runway. To someone out walking their dog, they’re a public footpath or a bit of grass for the dog to run free – you need to keep an eye out for such things. It’s a dynamic of dealing with an unlicensed strip. 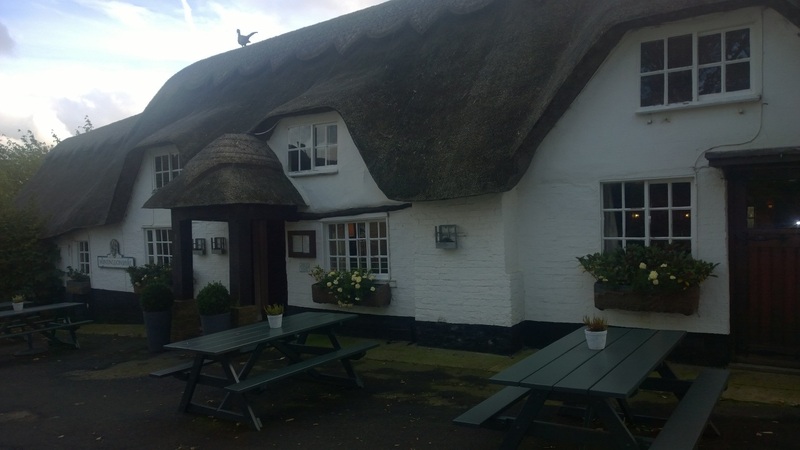 The Pheasant Pub : Reason enough to fly to this farm! Everything about Keyston is cool, the landmarks are picture postcard stuff. The strip is well maintained and I really enjoyed flying and getting the landing done here – I’m coming back just because the strip is great. However, the icing on the cake is that once parked up, you just walk down a 2 minute farm trail and you’re at the Pheasant pub. Sadly the one down side with being the pilot is I cannot drink, the rules on blood alcohol levels area quarter of that of driving – so the best advice is to simply not touch a drop of the stuff. Oh and although farms don’t typically charge you to land, this one has a donation system of £10, just tell the bar staff etc. Not the cheapest, but location, location, location! After an enjoyable hour or so in the pub, it was time to head back to the plane and head home. We’d been on the ground a bit longer then I’d planned, so we decided to cut the return journey short to a direct return to Cambridge. On the walk back we passed some walkers who inquired about if we’d flown in, I guess they’d just walked past the parked up G-HERC and seen the hi-viz jackets in hand. Can you think of a better way of getting to a pub then flying in? They seemed to agree it makes for a pretty nice day out. I selected a decision point for aborting the take-off if needed, then fired up the engine and taxied up to the far northern end of the runway, giving myself as much runway as physically possible. The strip drops off towards its southern end and I didn’t want to be fighting a plane going in and out of ground effect as the runway rolled away from under it etc. 10 Degrees of flap for best short field take-off performance, holding it on the brakes while bringing it up to 2,000RPM. One last check my passenger was happy and not messing with seat belts or anything. Then it was simply a matter of releasing the brakes and charging down the grass strip. Airspeed came alive pretty sharpish, it was a comfortable take off. 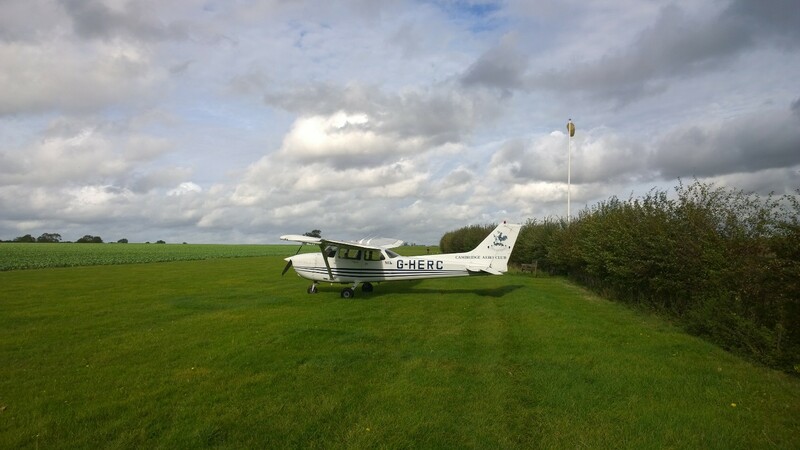 Grass strips tend to be a little bumpy but as long as they’re dry and you manage the elevator a little so you’re not putting weight onto the nose wheel, the take-off from a farm should be not much different to a take off from any grass airfield. A great day out, but sadly probably the last farm strip I’m going to do this year: The weather is beginning to turn for the worst and as the nights roll in, it’s an ideal opportunity to get a Night Rating done. This entry was posted on Sunday, November 30th, 2014 at 5:00 pm by PHC	and is filed under Flights, Post PPL. You can follow any responses to this entry through the RSS 2.0 feed. You can leave a response, or trackback from your own site.